15,000 BTU Built-In Stainless Steel BBQ Hibachi Flat Top GrillDrop-In Fried foods are easy with the hibachi drop-in grill. You'll be enjoying eggs, pancakes and stir-fry in no time. You can enjoy eggs, pancakes and stir-fry in no time with the Cal Flame Built In Hibachi Grill. This drop-in propane gas grill features all stainless steel construction, two 15,000 BTU concealed burners with individual controls, and a highly polished steel griddle plate. There is a large capacity grease trough for catching oil and a removable stainless cover that features the Cal Flame signature one-piece handle. With the Cal Flame Hibachi Grill, you can now prepare breakfast, lunch or dinner for your whole family in your outdoor kitchen. Home Styles Kitchen Cart in a Natural Wood finish with a stainless steel top features a solid wood construction in natural finish, two easy open utility drawers on metal glides with brushed steel hardware, adjustable slotted middle shelf can also be used as a wine rack; solid bottom shelf; brushed steel towel holder, and heavy duty locking rubber casters. Size: 44-inch W x 20-1/2-inch D x 36-inch H.
This KitchenAid 29.94-inch gas range top features premium commercial styling that fits easily within the space requirements of most residential kitchens. Four burners give you several options to match both your cookware and cooking style, including the powerful and versatile 20,000-BTU Ultra Power dual-flame burner and the simmer/melt burner, which works wonders at keeping sauces and soups warm. 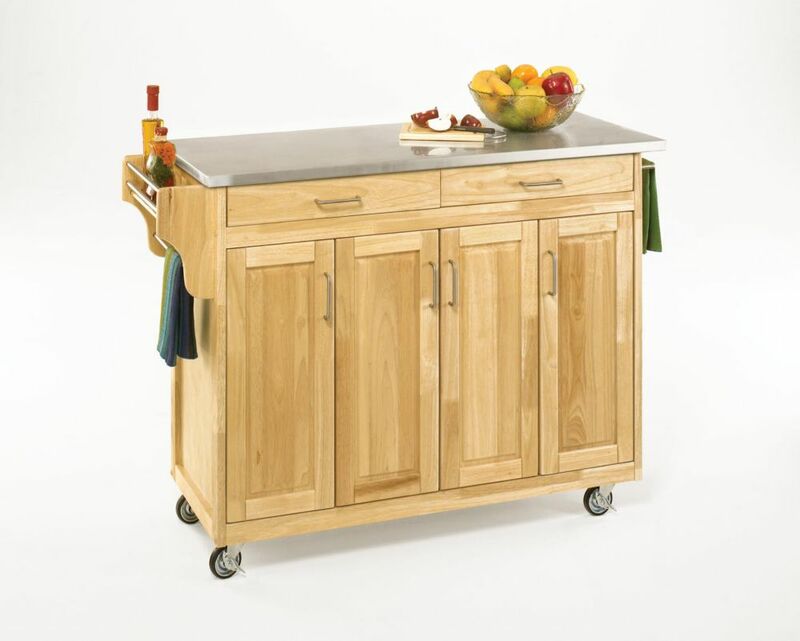 Create-a-Cart Natural Finish Stainless Top is rated 4.3 out of 5 by 7. Rated 5 out of 5 by Kitn from It met all my expectations!!! Very well made. I love it. It met all my expectations!!! Very well made. I love it. Rated 5 out of 5 by Anniej from Pretty easy to assemble, nice and sturdy and looks good. Pretty easy to assemble, nice and sturdy and looks good. Rated 3 out of 5 by Youngstown from The honest review this product needs: ... The honest review this product needs: PROS: 1) APPEARS - exactly as pictured online. 2) QUALITY - of the cart feels sturdy. 3) CONVENIENCE - of having the option of whether you want to attach the spice/towel rack(s) allows it to easily fit into a corner. CONS: 1) ASSEMBLY - for this product was much more difficult than expected. My biggest complaint is that some of the pre-drilled holes did not match up with the corresponding pieces (see picture), requiring me to drill my own holes in order to put the cart together. This was fine considering I had the appropriate tools to do so, but this is unacceptable considering the overview boasts an easy assembly that “requires only common household tools.” My second grievance is that the instructions for the top is universal between other kitchen carts and therefore contains instructions/assembly parts for those other carts without any forewarning of doing so. I spent half an hour trying to improperly put the top on my cart simply because I was unknowingly following the wrong instructions. 2) QUALITY - of the counter top portion is disappointing. Setting ceramic plates, silverware, etc. causes easily noticeable scratches that cannot be buffed out. If you plan on setting appliances on top of this that will never be moved this shouldn’t be an issue, but if you actually plan on using it as counter space… forget it. All-in-all, the cart serves it’s purpose well. We ended up taking the spice rack off so that we could fit it in the corner and we use the counter top to store our mixer, Keurig, and Ninja. Rated 5 out of 5 by Kat from I love it! It took no time to put together, and all parts were there! I love it! It took no time to put together, and all parts were there! Rated 3 out of 5 by DCapartment from Drawers don't quite fit, but otherwise good Overall, we like this cart. However, one of the drawers is unusable, and one of the drawers is difficult to use, because the stainless steel top presses down on the front panel of the drawer. That is, the front panel of the drawer is a few millimeters too high to slide in and out without being blocked by the stainless steel top. We had to shove one drawer in so that it would not stick out, and the other drawer rubs against the top whenever it is used, although it just needs a push rather than a hard shove to get it to go all the way in. I suppose we could have sanded down the top, but not without losing the finish, and frankly the cart should be manufactured with the proper measurements in the first place. Other than that issue, the cart looks good, is the right size for us, and the wheels and doors (and the sliders on the one working drawer) operate smoothly. The directions for construction were not difficult to follow. Rated 5 out of 5 by Susan from Good product. I purchased this to replace a similar, but smaller, product by the same company. Except for an issue with the top clearance for the drawers (which I was able to fix with a shim), it went together easily. Love the stainless steel top. Drawers and doors open and close cleanly. Only negative was that it arrived well before the delivery date and I was out of town. Fortunately, it didn't rain and no one stole it :-) It was more expensive than I expected for a DYI but the quality was good. Rated 4 out of 5 by olddad from not a bad portable island for our kitchen Good kitchen island, I was leery about buying it sight unseen and only based on measurements and pictures. assembly was relatively easy once the kids left me alone. the drawer assembly instructions seemed OK, but following the directions meant the drawers would not close right. fixed it and the work now. We bought this for extra cabinet and workspace in our kitchen. Right now we use it for the kitchen aid mixer, and all its parts, a blender, and storage for extra pots/crock pot etc. The shelves are adjustable which helps for tall items, the middle portion is nice and wide which helps for the crock pot and dutch ovens. Is this product made of natural wood (e.g. pine?) with a clearcoat finish, or is it made from MDF? This product is constructed of an Asian hardwood called rubberwood.